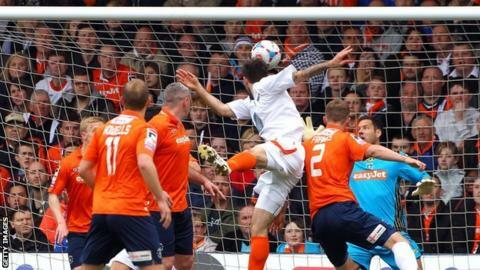 Ten-man Braintree held off a Luton fightback to delay their promotion back to the Football League. Luton would have won the Conference Premier title with a win but Dean Wells and James Mulley put the Iron 2-0 up in 21 minutes. Visiting keeper Nick Hamann was sent off before the break but Chez Isaac slotted home a third before Luton's Jake Howells scored from the spot. Alex Wall struck from the edge of the area but they could not force another. The Hatters are 10 points clear of second-placed Cambridge having played one more game than the U's but Richard Money's side - following a 7-2 defeat of Hyde - must win against Kidderminster and Lincoln in the next six days to keep their title challenge alive. A total of 10,020 fans packed out Kenilworth Road, with most hoping to see their team get the victory they needed to win promotion after five years in non-league. However, missing 27-goal top scorer Andre Gray through injury, Luton fell behind early on when Wells rose highest to head home a Daniel Sparkes corner. It got worse for the hosts with the play-off chasing Iron scoring from their next attack through Mulley's finish from Dan Holman's cross. The Hatters, who had lost just once at home all season, were handed a lifeline before the break when visiting keeper Hamann was given a straight red card after needlessly charging out of his area and fouling Paul Benson. Alan Devonshire's side were defending admirably and scored a third goal against the run of play in the second half when Isaac was left one-on-one with home defender Steve McNulty and kept his cool to finish well. Just when it looked like the game was beyond Luton, visiting defender Ryan Peters was adjudged to have handled in the area and Howells scored confidently from the penalty spot. The goal reinvigorated the home crowd and Wall's powerful strike took a deflection to fly into the back of the net and make it 3-2 with over 25 minutes to play. Mark Cullen came close to levelling when his shot hit a post as John Still's side poured forward. The Hatters failed to force replacement keeper Nathan McDonald into any more action of note but their promotion is surely still a matter of time. "I don't think we played well enough to win. I thought we were poor first half, better second half, but not enough to win. "We scored two goals from home today, and not got anything from it. That's disappointing because normally if we scored two goals we would have got something. "2-0 down is tough. 3-0 down is even tougher. I think we just had people out of position. When you're 3-0 down you don't give yourself a chance. "I think our organisation and discipline let us down today. I'm the manager, I have to take a bit of responsibility. I set it out, if people haven't followed it, perhaps I haven't done my job properly." Match ends, Luton Town 2, Braintree Town 3. Second Half ends, Luton Town 2, Braintree Town 3. Offside, Braintree Town. Matt Paine tries a through ball, but Matt Paine is caught offside. Attempt blocked. Alex Wall (Luton Town) left footed shot from outside the box is blocked. Attempt missed. Daniel Sparkes (Braintree Town) left footed shot from outside the box is too high from a direct free kick. Fraser Franks (Luton Town) is shown the yellow card for a bad foul. Alex Jakubiak (Braintree Town) wins a free kick. Attempt blocked. Scott Griffiths (Luton Town) left footed shot from the left side of the box is blocked. Attempt blocked. Pelly Ruddock (Luton Town) left footed shot from the centre of the box is blocked. Substitution, Braintree Town. Alex Jakubiak replaces Jordan Cox because of an injury. Mark Cullen (Luton Town) hits the woodwork with a right footed shot from the centre of the box. Mark Cullen (Luton Town) wins a free kick. Alex Wall (Luton Town) is shown the yellow card for dissent. Goal! Luton Town 2, Braintree Town 3. Alex Wall (Luton Town) left footed shot from outside the box to the bottom right corner. Goal! Luton Town 1, Braintree Town 3. Jake Howells (Luton Town) converts the penalty with a left footed shot to the bottom right corner. Penalty conceded by Ryan Peters (Braintree Town) with a hand ball in the penalty area. Substitution, Luton Town. Alex Wall replaces Luke Rooney. Steve McNulty (Luton Town) wins a free kick.